Lava Mobiles, has launched two new handsets today which include the KKT 39 which is an entertainment handset and the KKT 50 which is a full-touch handset. Both the handsets fall around the Rs. 3,000 price budget. 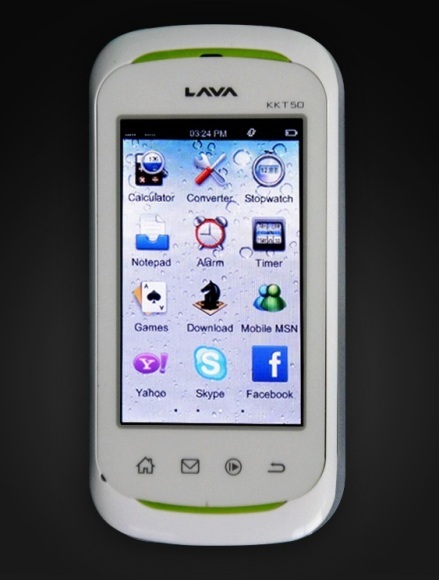 The Lava KKT 39 offers surround sound system with Yamaha PA speakers, a 2.4 inch QVGA screen, 15 pre-installed mobile games, a 1400mAh, a digital camera and a 2 GB memory card. The KKT 50 has a twin coloured body with inbuilt short cut keys. Other features include a 2.8 inch screen, has “Widgets shortcut” feature, an inbuilt WAP browser, FM Radio with recording feature, in-built games and “Skymobi” – Lava’s platform to download latest bollywood songs, images, wallpapers, games and videos. Update : We had a talk with Lava team and we were informed that Lava has invested in a Research and Developement Center at Bangalore for it’s mobile business.